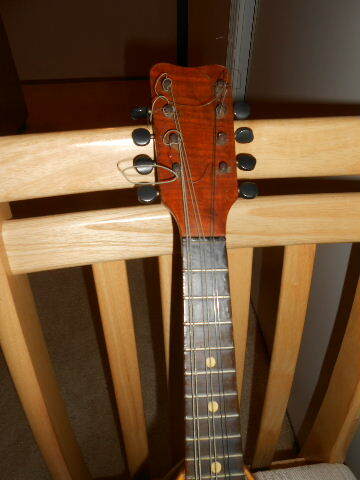 Growing up, I was intrigued by the musical instrument that sat on a shelf in our hall closet. It had a short neck, a round body, and beautiful wood patterns. 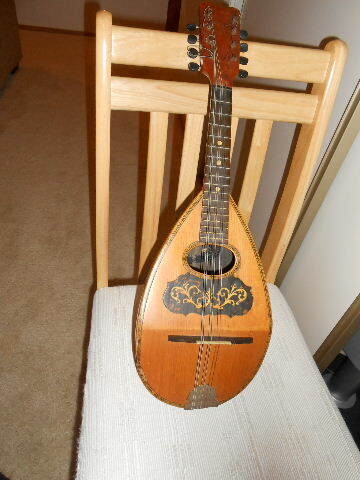 I was told it was a mandolin. But, where did it come from? I imagined it was one of those things my dad acquired. He was good for that. We had all sorts of old things lying around the house, yard, and garage that he swapped for something else. 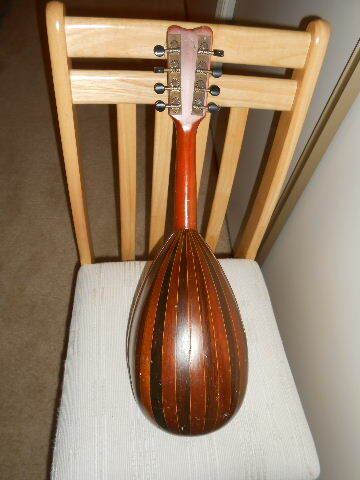 It turns out this beautiful musical instrument belonged to his mother, Anna (Mazeres) Lassalle. She learned to play as a young woman. Why the mandolin? It may have to do with it’s resurgence in popularity in the 1890s among the French. In the early 1900s, there were Mandolin Orchestras throughout the country. The Mandolin “Estudiantina” of Mayenne, France was very popular in 1900. I would suspect that popularity spread to French communities in America. 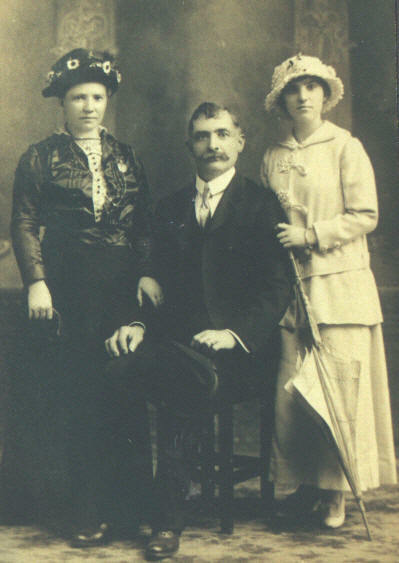 My grandma was born in San Francisco in 1898, but her parents, Charles Mazeres and Brigitte Breilh, were natives of France. As the French community in the San Francisco Bay Area was quite large, there may have been a French connection…so to speak. It could have been one of those things French parents expected their children to learn. Her family was upwardly mobile. Her parents owned a couple of French laundries. Perhaps playing the mandolin was the proper accomplishment for a young woman growing up in the French community of the San Francisco Bay Area at the turn of the century. When my grandma died, my dad brought home a box of 78 rpm records that his mother owned. They were all of French performers. I think that music must have been important to my grandma though I can’t recall music ever being played in her home. But, her children took music lessons. My dad played the harmonica and was never seen without it. His brother, Charlie, played drums and would march in the drum corp of the local newspaper. His oldest sister, Julie, was a gifted pianist who could have played professionally but gave it up for marriage. 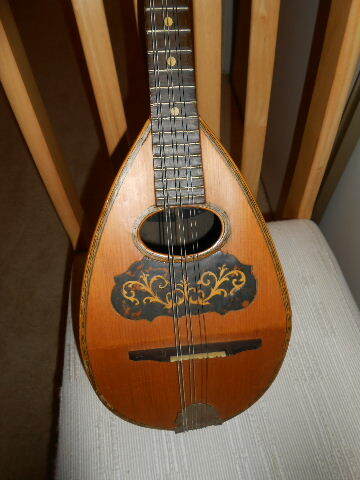 Here are some more views of grandma’s mandolin. Looking pretty good for over one hundred years old, don’t you think? If you’d like to know more about the parts of the mandolin, check out this anatomy diagram. I wish I’d asked my dad more about his mother. Heck, I didn’t even know until after my dad died that he played the harmonica. I wonder if she played for her children. I’ve heard that she was quite good. I don’t know though because she never played for us. Once asked grandma about the mandolin. She shrugged it off and gave that grandma look, the one she gave when you tried to take her photo (she hated having her picture taken). The conversation moved on and that was that. Perhaps it was something that young ladies did, but not old women who were mothers and grandmothers. There are many things I’ve only just begun to learn about my grandma. The quiet, stoic woman with the cackling laugh held many talents that I wasn’t aware of. She was a tease and liked to play practical jokes. I will always regret not asking her more questions about her life. If you’ve never heard traditional French folk music or the mandolin, check out the lovely song in this video. Did your grandmother or other female ancestor play a musical instrument? If so, what did they play? Tell us in the comments. When we are young, we don’t realize how little time we may have to spend with our loved ones, and that some day we might want to know everything we can about our grandparents and others who came before us. Like you, I wish I’d learned more. Thankfully, I came from a long line of story-tellers, so I got to hear lots of stories. Anything we children could do to get our grandmother talking about her past, we would do, because she told the best stories. Sadly, I’ve forgotten many of them now. Never thought that would happen either. Today, I record as much as I can remember, not just of my life, but of the ones I knew, so my children and grandchildren can find my notes, hopefully, when they’re ready for them. Wishing you the best of luck learning more about your grandmother and her beautiful mandolin. Kathryn, You are so lucky that stories were shared freely in your family. I noticed as my dad got older he told more of them. My mom is starting to do the same. I’m trying to write down what I can. It’s so easy to forget even when we’ve heard a story a hundred times.